Most guitarists at some point learn how to tune a guitar using the 5th fret method where you essentially tune a guitar "to itself" (known as relative tuning). This is perfect for when you don't have access to an electronic tuner, online tuner or any other pitch reference (e.g. a piano to tune your guitar to) and you're just playing alone. If you are just playing alone, tuning a guitar to itself doesn't have to be accurate in the sense that the individual strings don't need to be absolutely tuned to their desired notes (E A D G B e). As long as they are tuned relatively your music will sound in tune. Start with the lowest/fattest string, this will be your base reference for tuning the other strings. Again, it doesn't matter if the low E is in fact nearer to an E flat, because the other strings will be tuned in relation to whatever note that 1st string is. Note: Tuning up ensures the string's tension is locked and will therefore stay in tune longer. 4) Repeat the same process, but with the A string at the 5th fret and the D string open - tune up or down until the A string at fret 5 and the open D string become the same note. 5) Repeat the same process, but with the D string at the 5th fret and the G string open - tune up or down until the D string at fret 5 and the open G string become the same note. 6) This is where it changes slightly, because the tuning interval between the G and B string is different. Instead of tuning to the 5th fret, fret the G string at fret 4. Then just follow the same process of tuning the B string up or down until it becomes the same note as the G string at fret 4. 7) Finally, it's back to the usual 5th fret method, with the B string at fret 5 and the open high E string. Follow the same tuning process as before! 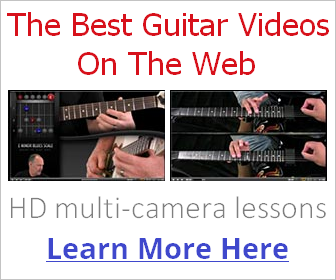 So, you should now know how to tune a guitar to itself anywhere! Play a few chords to hear how accurately you tuned up, and make any tweaks necessary (the guitar's tension is altered slightly for each string you tune so you may need to go back and fine tune). Over time your ear will become more accurately trained to matching up those notes, and you'll eventually find this to be the quickest and easiest way to tune up when playing by yourself or just with a vocalist or percussionist.